Sometimes, it’s the simplest things in life that make me the happiest. That first sip of hot coffee on a cold morning (from the 56th adorable Target mug you just had to have). The way the sun hits my son’s eyelashes “just so.” The feeling of crisp, clean sheets. The smell of melted chocolate. The way my dogs always know when I need an extra snuggle. These simple pleasures inject everyday life with jolts of appreciation and happiness. They bring me back to the now and make me savor the moment. Another experience that makes me disproportionately happy? Making my own granola. I know, I know. I’m weird. I know it sounds silly. Making granola isn’t quite as gratifying as fresh sheets or my sweet son’s eyelashes, but hot damn if it doesn’t make me happy. Granola is one of my favorite snacks. I eat a lot of it. Most of the time, it’s by the handful out of the bag or jar, all by its lonesome. Sometimes it’s over yogurt. Or as a crunchy topping to my smoothie. But most of the time? I eat it straight. There’s something so satisfying about that crunch. It’s usually slightly sweet with a savory note here and there. It gives me a ton of energy, and totally meets my mid-afternoon snack needs. AND! If you make it at home, it can be very nutritionally sound. I love it. 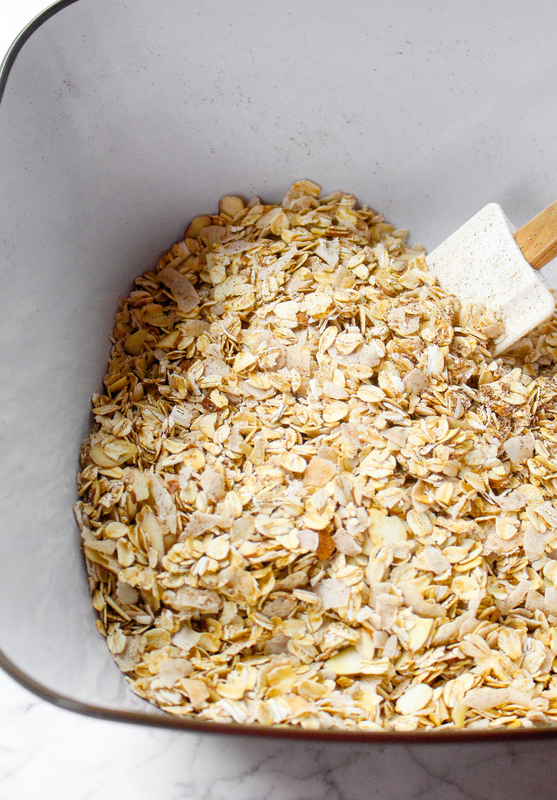 Most of the time, you can find a large batch of homemade granola in my pantry. I have it on hand almost all the time. 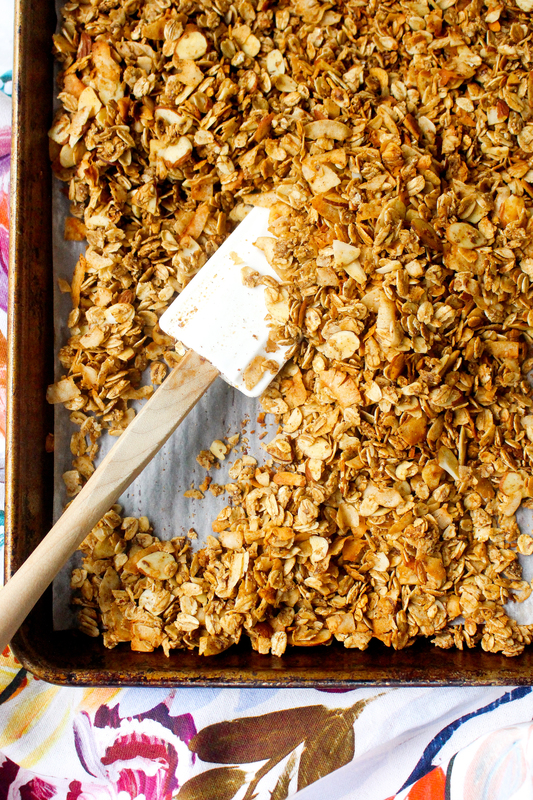 My ultimate granola recipe is this one (seriously, make it if you haven’t already. It’s insanely good), and today’s recipe is a loose adaptation of that recipe. Because why mess with a good thing? Today’s tweak comes in the way of COFFEE. Yessss. The stuff must course through my veins, people. I love my java. My enjoyment can be broken down into fourths: the aroma, the taste, the caffeine, and the ritual. Sometimes the ritual is half the enjoyment. Sitting down for a moment before starting my day, obnoxiously large mug of hot coffee in hand, is something I look forward to each night. Seriously. When I am climbing into bed, I often think about that morning cup of coffee and smile. Remember, it’s the small things, guys. So, given my affinity for coffee and granola, it really makes sense that the two would join in my recipe notebook. I jotted down the idea months ago and sort of forgot about it. I’m not sure how (because I was really freaking excited at the time), but I did. Then, as I was flipping through my random notes, I found it. 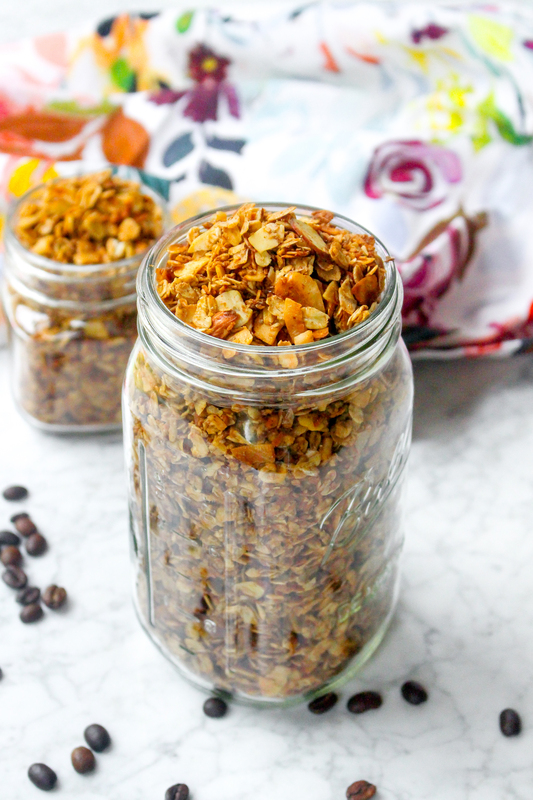 Scribbled in my half-cursive short hand: coffee granola. I looked up that coconut granola recipe and knew I wanted that to be my base. I immediately raided the pantry to see if I had what I needed on hand. I did. A half hour later, my house was filled with the most intoxicating aroma of coffee, toasted oats, and coconut. Aka, HEAVEN ON FREAKING EARTH. I need to amend my list of simple pleasures from the beginning of this post. 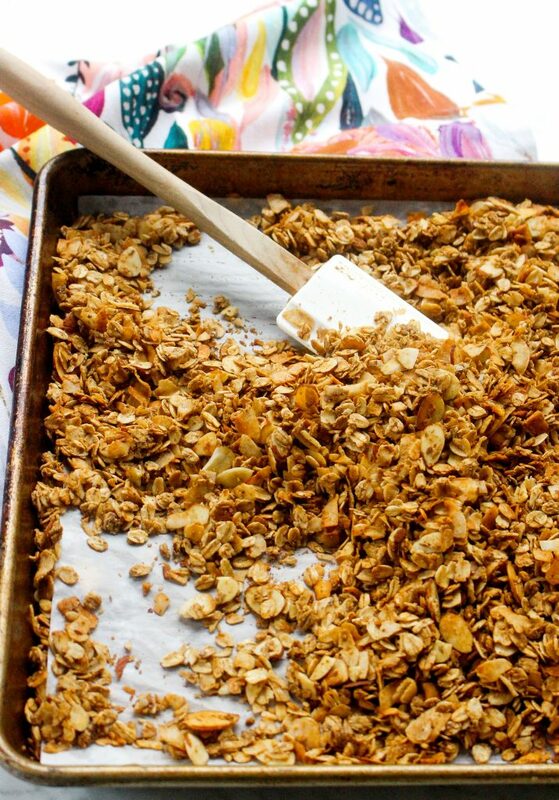 Add to it and move to the front: the smell of this coffee granola baking away. Good LORD, does it smell lovely. And the taste? Well, it gives the smell a run for its money. Toasty oats with the flavors of coffee, coconut, and nuts throughout. An irresistible crunch. A little sweet, a little savory. 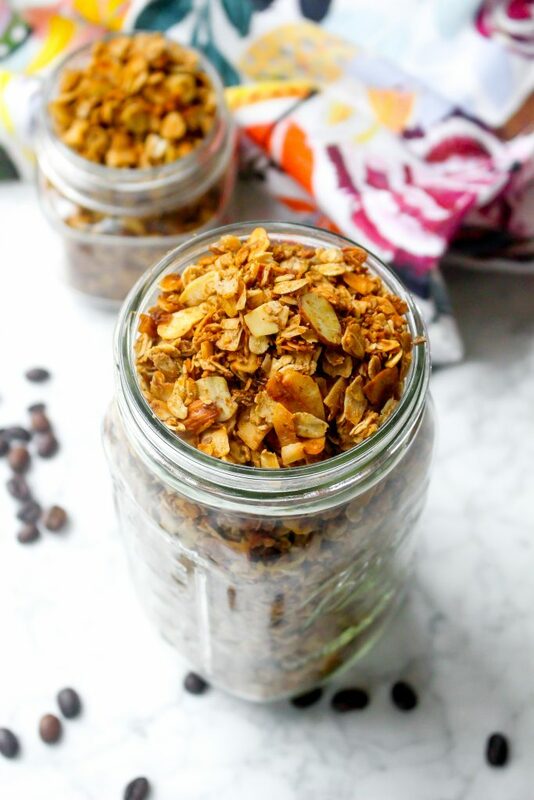 So, yeah, the taste of coffee granola is definitely up there with the first sip of coffee in the morning. It definitely makes the “simple pleasures” list! Preheat the oven to 300°F. Line a large baking sheet with parchment paper. 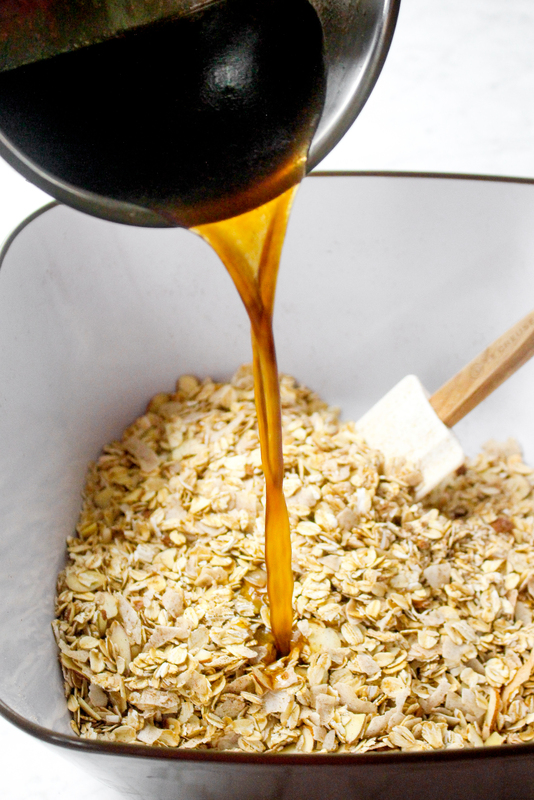 In a large bowl, combine oats, coconut, almonds, espresso powder, flaxseed, cinnamon, and salt. In a small saucepan over medium-low heat, whisk together the coconut oil, coffee, honey, brown sugar, and vanilla bean paste/extract. Whisk until the coconut oil is melted and the mixture is well combined. Remove from heat and then pour over the dry ingredients. Carefully toss well to evenly coat the dry ingredients in the coffee mixture. Spread the mixture out on the prepared baking sheet in an even layer. Bake for 25-35 minutes, stirring every 10 minutes, or until golden brown. 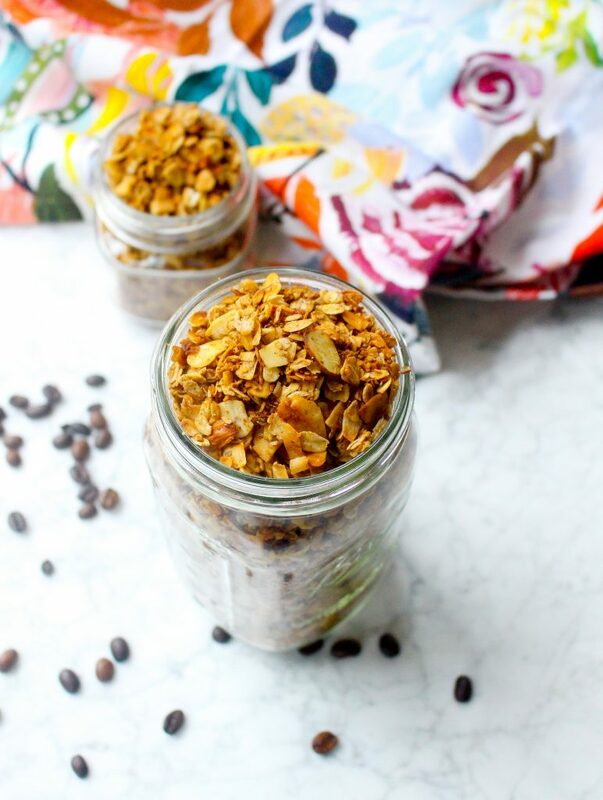 Cool the granola completely and then store in an airtight container.